A FINE goal at last ended Dumbarton's Ladbrokes Championship goals drought and gave them a 1-0 win over bottom side Brechin City. 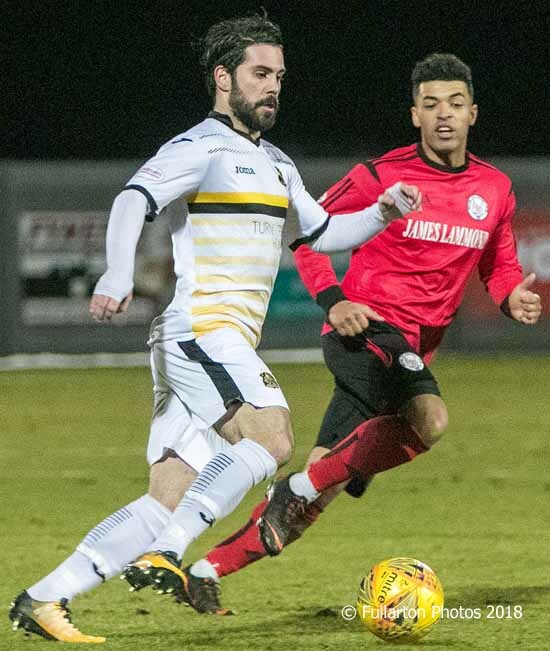 A FINE goal at last ended Dumbarton's Ladbrokes Championship goals drought and gave them a 1-0 win over bottom side Brechin City at the YOUR Radio FM 103 Stadium. The game, part of a double header with the Angus club, proved to be a difficult encounter for both teams because of the heavy pitch. Sons started well and should have taken the lead on 28 minutes following a surging run by Kyle Hutton who set up Dimitris Froxylias (pictured), but his shot was high and wide. On the half-hour mark, Brechin City thought they had scored following a scramble in the Sons box, with the ball being hooked off the goal line just in time. Seven minutes later Sons edged ahead, with 'Jimmy' making no mistake with his penalty box strike after good work by Andy Stirling. This was Sons first league goal in over 732 minutes of action! And it lead to their first league win of 2018. The second half proved to be drab, with very few chances created for both teams, and Froxylias's first-half goal proving to be enough for Sons to collect all three points.